Pune: “Swar Sannidh”, an organization dedicated for the promotion of Hindustani Classical Music inaugurated at hands of Pimpri-Chinchwad Municipal Commissioner Shravan Hardikar. This organization is founded by vocalist Meenal Datar. Renowned artist Milind Mulik and vocalist Archana Kanhere graced the occasion. On the auspicious occasion of Gudhi Padwa, inauguration ceremony held at Dhepe Wada followed by musical recital. The event began with Sitar recital by Nikhil Patwardhan who hails from the royal family of Sangli. He enthralled the audience with a wonderful recital of Raga Jaunpuri. Smt. Meenal Datar mesmerized the audience with a beautiful rendition of Raga Alhaiya Bilawal. She began with the Bada Khayal “Daiya Kaha Gaye”, then proceeded with the Madhyalaya Bandish “Kavan Batariya Gayilo” and ended the Raga with the Drut Bandish “Ja Re Ja Re”. On popular demand, she presented the Natyageet “Ka Dharila Pardes”. The program ended with the timeless Abhang “Avagha Rang Ek Zala”. She was supported on the harmonium by Shri Suyog Kundalkar and on the Tabla by Shri Nishad Pawar. 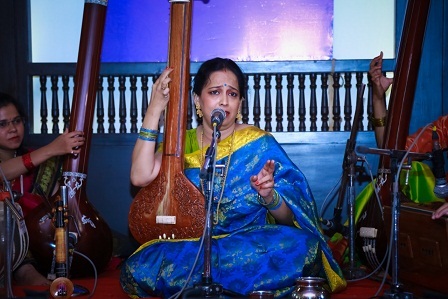 “It is my dream and mission to take Classical music to every nook and corner of the country, and Swar Sannidh will work relentlessly towards it”, said Smt. Datar on the occasion.